On May 7, 1694, in rebellion against brutal conditions and labor without pay, first mate Henry Every led a mutiny of the sailors on Charles II, declaring, “I am a man of fortune, and I will seek my fortune!” After successfully commandeering the ship, Every was elected captain, and rechristened the Charles II as The Fancy. Every and crew went on to become the most celebrated pirates of their day, capturing fortune for captain and crew, and leaving a dangerous example of successful rebellion in their wake. In his fantastically raucous book, Mutiny! Why We Love Pirates and How They Can Save Us, English math teacher and theological pirate @KesterBrewin presents a history of piracy, emphasizing the way that piracy emerges throughout history at times when the Commons become enclosed by those in power. Piracy is a rebellion against the exclusive possession of goods by the few at the expense of the many. Brewin presented his work recently at Subverting the Norm: Can Postmodernism Theology Live in the Churches?, a conference organized by @PhilSnider and @KSMoody. The conference was a gathering of academics and practitioners of radical theology. Participants (and they were participants: one-third of us presented at some point during the two-day conference) came from a variety of academic, denominational, and non-affiliations. All came to further the developing conversation around radical theology, and to get to know those involved in the mutiny radical theology represents. Jack Caputo (not on twitter – for shame!) quickly substituted “radical theology” for the more bland “postmodern theology”. If flying the “postmodern” flag helped bring people into the conversation, hoisting the Jolly-Roger-esque “radical theology” flag was a sign of this theology’s new identity. Brewin points out that sailors lived brutally short lives. Their deaths were recorded in the crew roster: a small skull and crossbones with wings next to a name indicated a death. After mutiny, pirates took the symbol (sans wings) as their flag, proclaiming that “we are the dead”: dead to the navy, dead to the demands of the empire. Much like the later Anarchist rallying cry of “No Gods, No Masters!”, or the Lacanian proclamation of the “death of the Big Other”, the pirates under the Jolly Roger established the possibility of their future on the rejection of their past. Caputo describes radical theology as the radicalization of some context. Every radical theology has a history and tradition it engages. There is no radical theology outside the church, then. Radical theology can only live “in” the churches, as it were. But can it live there? This is the question that generated the conference, and continues to be engaged as the conversation spills over onto twitter and the various blogs run by conference participants. @TrippFuller broadcast a number of key talks and panel discussions via his @HomebrewedXnty podcast. Caputo’s description of radical theology radicalization of a certain tradition draws a strong parallel between radical theology and piracy. In a mutiny, the ship is commandeered, not rejected. If piracy is a rebellious response to the enclosure of the commons, it rejects enclosure because of the value of the goods enclosed to all. Radical theology, like piracy, does not reject tradition and theology, but stages mutinies that liberate and redistribute the goods. So radical theology is a deeply faithful spiritual practice (1) that responds to the event that produces the goods in question. In Caputo’s terms, it is a response to the call of the event that is harbored in the Name of God. Each tradition names the event in a way that encloses the event in some way – radical theology responds by staging mutinies against all attempts at enclosure. Radical theology, like piracy, is also a generous form of engagement – it is “for others”. Pirates were termed “Villains of All Nations”: the rejected ones who dared rebel against the empires that had enclosed the commons. As outsiders, pirates were free to welcome all to their ranks. They were much like the Christians who Paul described as the “trash of the world”. The fortune recaptured from enclosure was distributed among the pirates. Power was likewise organized along democratic lines. So far, so good, but how does this play out in contemporary practice? The STN conference staged some successful mutinies against enclosure. Costs for participation were kept low, conference attendees were often presenters, and the “names” that presented attended other sessions, and circulated as “part of the crew” as it were. Q and A sessions translated easily into local pubs, where conversations continued long into the night. @ikonNYC presented a panel discussion where ikon participants shared their experiences in organizing a radical collective in New York. Key to the conversation was a demystification of the experience in order to encourage others to start their own groups according to the needs of their communities. Radical collectives, like radical theology, radicalize their context, and so need to focus on what is to come rather than what has gone before. @laserpony, @keegzzz, and @perrodin and @adamdmoore of VOID collective presented a radical liturgy experience which radicalized the STN space. They offered a liturgy that concluded with Eucharist. As each participant received the bread and wine, the words of ministration were simply, “There is no secret”, a blessing, indeed, for a group of people encountering loads of new schools of thought, complete with new vocabularies and library-length book lists. And yet the STN conference had major failings. Despite the variety of perspectives presented by the “headliners” (who engaged gender, colonialism, abilism, racism, and other sites of enclosure), attendees were largely conventionally educated, straight, white males. Attendees @michaelcarlbudd and @XochitlAlvizo staged a mini-mutiny in calling out organizers for setting a key panel on diversity in a breakout session, rather than highlighting it at a plenary. Organizers responded quickly, moving the panel to the fore, and setting two panels in dialogue with each other to tackle head-on the ways in which STN had yet to subvert the norm in question. This final plenary stood as the clearest evidence of the potential for radical theology to succeed in its attempt to break enclosure, and set clear expectations for the next STN conference. 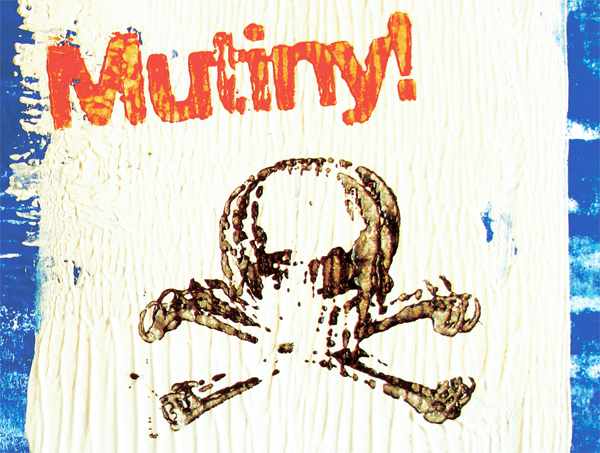 Mutiny is an event, a response to event, an ongoing engagement. Mutiny does not establish a new, fixed, and perfect order. Henry Every became one of the most successful pirates of all time, and committed atrocities as he did so, atrocities against women and slaves that perpetuated the very kind of enclosures mutiny rebels against. No Gods, No Masters? No Big Others, and No Heroes, then, but Mutiny, mutatis mutandis. (1) See the work of Katherine Sarah Moody (@KSMoody) on radical theology as spiritual practice, and on the measurable impact on the lives of those engaged in the project.